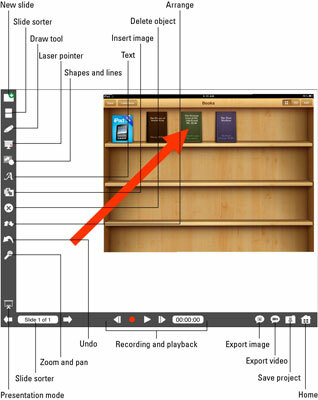 Explain Everything iPad app records your voiceover narration and actions onscreen in a screencast that can be replayed over and over. Create screencast iPad tutorials to demonstrate concepts to students in class, or provide course content outside the classroom for flipped learning. Explain Everything also a wonderful job of linking to the cloud-based accounts such as Facebook, Dropbox, Evernote, and YouTube, so you can import files easily. New Slide: Add slides to your project by tapping the + icon in the top left of your screen. Adding slides is especially helpful if you want to prearrange content on different slides and move between them while recording your screencast. Slide Sorter: This tool displays thumbnails of all your slides. Tap and drag any one to a new location to change their order. Draw: Tap and hold the pen to change options such as color, thickness, transparency, and even the type of pen tip. Use it for anything from scrawling some numbers to doodling a Picasso! Pointer: Use the Pointer during your screencast to highlight anything onscreen without marking it. Tap and hold it to choose the style of Pointer. Shapes and Lines: Tap to select a shape such as a circle or square, then drag to draw it. You can also change its color, transparency, and border. Text: Tap and hold to change text options such as size, font, and color. Insert Image or Web Browser: Add images from your iPad photo library or from any of your linked cloud accounts. You can also tap the From Camera option (iPad 2 and higher) to take a photo with the iPad camera and insert it directly. After selecting an image, you can crop or rotate the image before insertion. You can even insert a fully functioning web browser on a slide. Edit the top line of the browser to type the address of the website you want. 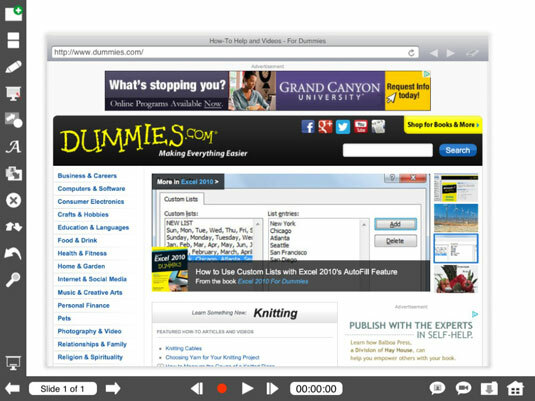 Use the browser window to demonstrate and highlight content on any webpage during your screencast. For example, if you want to create a tutorial about how to navigate the school website, you can insert a browser window into your Explain Everything project, type the web address of the school website, and demonstrate how to use it. Use the Pointer to highlight items and the Draw tool to mark up and annotate them. Delete: Tap an object then tap the Delete icon to remove it. Arrange: Select any object by tapping it and then tap the Arrange icon to move it behind or in front of other objects. Undo: Don’t you wish everything in life had an Undo tool? Well, Explain Everything does. Zoom and Pan: When you tap this icon, you can use the standard two-finger pinch and reverse-pinch gestures to zoom in and out of your slide. Presentation Mode: Hides most of the toolbar icons. Use it to present in full-screen mode, and tap it again to return to your normal screen with toolbars. Slide Sorter: Tap the arrows to move between the different slides. Tap the Explain Everything icon. The Explain Everything app opens and displays the Home page, where you can select options to start a new project or edit an existing one. Tap the New Project button on the upper-left to get started. You’ll be prompted to start with either a blank project or by importing content such as documents or images you have stored in your iPad photo library or in one of many popular cloud services. Tap New Project to start a blank project or to import content from your cloud accounts. You’ll need to link to your cloud account first by tapping the Preferences button on the top right and linking any of the accounts offered to Explain Everything. Explain Everything will import images, documents, and even presentations and spreadsheets. When imported, each document page, presentation slide, or photo is placed on a separate slide in Explain Everything. Once you select one of the options for starting your project, Explain Everything displays the editing window. Add a slide by tapping the New Slide icon. Use the tools to add drawings, images, shapes, and text to the slide. Draw, type, annotate, use the laser pointer, and more. The best screencasts capture the viewer’s attention by being entertaining and easy to understand. Make your screencast interesting and use the tools to help illustrate your points. Repeat Steps 4 and 5 to add and edit more slides. Remember that you can delete and arrange objects, sort slides, and undo anything you don’t like (or did accidentally). Prepare and rehearse your narration. Tap the Record button and start recording. The timer will indicate time elapsed as you record, and a Pause button will appear. Tap the Pause button to stop while you adjust content, change the slides, or simply collect your thoughts. Tap Record to continue when you’re ready. Start over by tapping the Rewind button and starting your recording again. Complete and save your screencast by tapping the folder icon with a downward arrow. 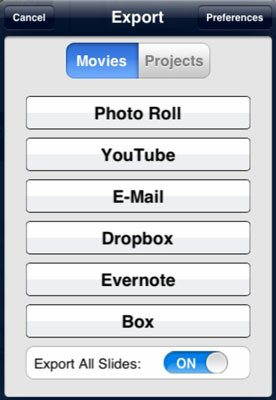 Tap either the Export Image or Export Movie icon in the bottom-right corner of the display. The Export dialog appears. You can choose to export your screencast as a video, image, or even a PDF document; send it directly via e-mail; or export it to the iPad’s Photo gallery, YouTube, Dropbox, and more.